During the last season at Powderhall, one of the major events was the Golden Greats meeting staged by 4-times World Champion Barry Briggs. It was one of a series of such events that Briggo put on around the World and it made for a marvellous evening of nostalgia at Powderhall. A warm summer evening with some of Speedway's greats on show, and a huge crowd there to welcome them. 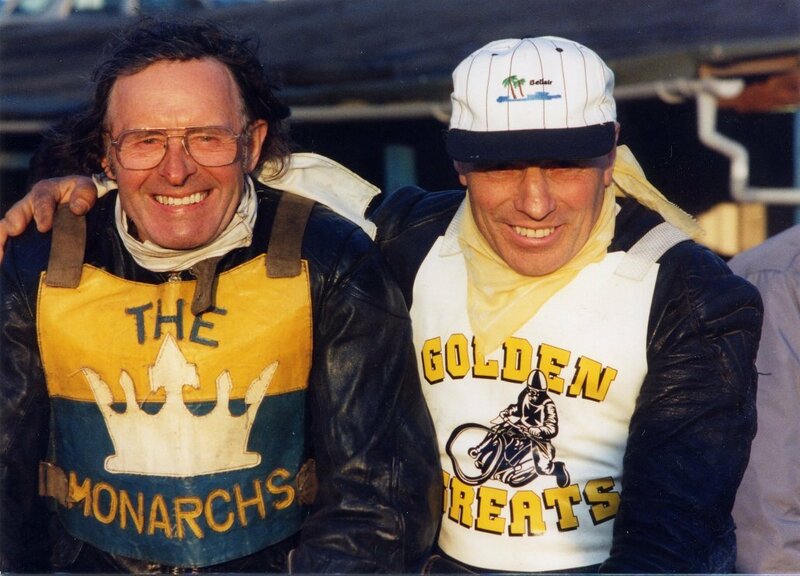 Although men like Barry Briggs, Ove Fundin, Bengt Jansson, Peter Collins and many more were on show, we have chosen this chummy shot of 1960 Monarch team mates Fred Greenwell and Doug Templeton. Both performed brilliantly, with Freddie especially decked out as if we were still in the Provincial League - flying scarf, old-style race jacket and chrome machine.